During most recent Australian Clash of Kings I had a chat with our current Master (and defending champion! ), Jeff, about pros and cons of using Universal Battle as an additional way to play Kings of War. I highly recommended the platform because I have been using it for a few years already. For me it is a great opportunity to play against players whom I may not have a chance to play otherwise. In particular, if they are located on the other side of the world! Universal Battle is also great for trying new army lists and units before committing to buying and/or painting them for your collections. I found that it often helped me choose the next painting project better. Besides, you cannot go wrong with just playing more games of Kings of War. 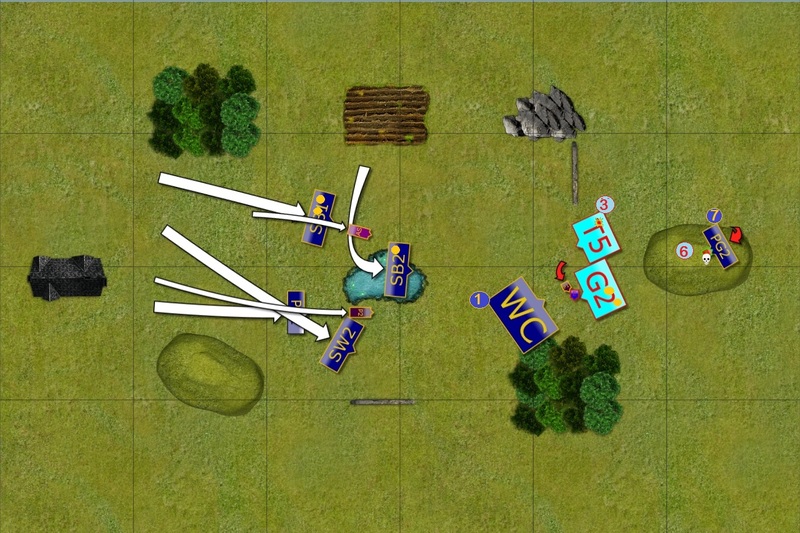 Jeff was very interested in trying that out and we had a few Skype sessions where we simply went through features of the program, then building and saving units/armies and finally we decided to give it a go for a proper battle. It was also a fantastic opportunity for me to play against Jeff as we have not yet played against each other despite attending a few events together. Apart from being a fantastic player, Jeff is also known for bringing huge variety of armies to the tournaments. Not only by often playing each event with a different faction but also bringing unique lists in the frame of particular army. (Edit: I think there were two more items, Banner of Griffin and Staying Stone somewhere, but I cannot tell where at this stage. I will try to update this information later). 2 x 6 Depth Horrors - I had a chance to play against them before and I noted it is quite important to eliminate them early. They hit on 3+ and with Crushing Strength (1) they can do a lot of damage. They usually suffered from the low defense of 3+ and while their Speed 6 is good, they often where out charged by the cavalry. However, with the updates they are now Fearless that means they cannot be wavered. It is a very good ability, in particular for the unit that will most likely take some damage before it gets into melee. 2 x 6 Gigas - another type of Large Infantry and the one I probably didn't have a chance to play against much. They are a bit slow and do not have Ensnare option but at the same time they hit hard and have excellent defense 6+ to the front thanks to Big Shields. Ideally, this unit should be attacked from the flank to avoid good defense anyway. Perhaps it can also be avoided due slow speed but I expected that they may form second line of advance to prevent the fliers to land behind the faster elements of the army. 6 x 20 Thuul - that is a completely new type of a unit for me and Jeff brought 6 of them! Thuul got some important upgrades but let's start from what they had already. First, you may notice that they have 20 attacks and hit on 3+. That is great, especially with Bane Chant nearby. They already had Ensnare too which makes them more difficult to hit in melee. However, they got more upgrades that made them even more interesting choice. First, they got Stealth that is very helpful for a fragile unit with defense 3+. Second, they are now Speed 6 which actually makes quite a difference too, as they are one of the fastest infantry units in the game. The fact that Jeff had 6 of them added a lot of consistency and redundancy to the list. 2 x Thuul Mythican - with so many Thuul regiments it is probably not surprising to see some Mythicans too. They inspire the regiments for starters but they are also "fighting wizards", i.e. can have spells and have quite good fighting capabilities with 5 attacks, hitting on 3+ and Crushing Strength(1). They are a bit fragile with defense 4+ and low nerve but at the same time combination of Stealth and Individual as well as Ensnare means that they will be very hard to hit by shooting and not easy to hit in Melee. Taking them down will be difficult but disordering will be quite useful, if only to prevent spells to be cast or limiting mobility of the flying Mythican. Envoy - this is a typical but very useful hero that provides another source of inspiring as well as Bane Chant option. In general I faced melee orientated army with 13 elements, just 1 less than my own. However, each element of the opposing army had good nerve as they were all regiment or hordes. Hence, I would rather avoid one-on-one fights. I could not use shooting as main option to inflict damage as big percentage of the enemy army had Stealth that would significantly limit the efficiency. Because of that I would rather shoot at some unit or units to make them more vulnerable in melee or to finish the damaged ones. What I perceived as advantage is the mobility and maneuverability of my army. The opposing force was fast enough to get close quickly. But if I could limit the ability of Thuuls to intercept my fliers with my own fast heroes, I hoped to get my own units into a good position for combined charges. It was also important to engineer these fights like that in order to limit the impact of Ensnare. I expected a lot of exchanges happening as with similar number of units and the focus on melee, Jeff would still have the means to fight back after any attack I can mount against his army. It was thus important to be able to gain a bit of an advantage first due to shooting and timely charges. So that any further exchanges would happen on favorite terms. As always, that was the initial plan based on quick explanation on what the units have and it was further updated once the scenario was revealed. We used amazing Epic Dwarf Map Pack and their terrain and scenario randomizer. This time we got Map number 8. Deployment of the Armies - Push tokens are marked as yellow tokens. We got Push as the scenario and rolled 2 tokens each in addition to the middle one. We both elected to add them a single unit. 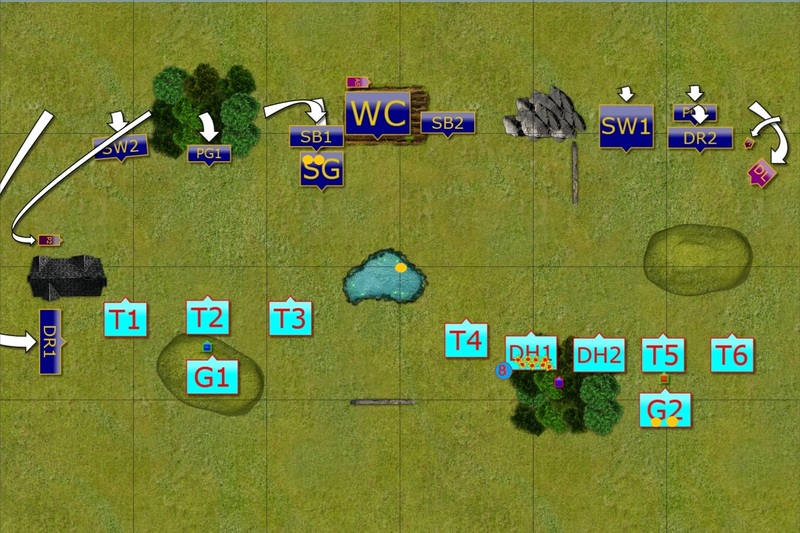 Jeff placed them with the single Horde of Gigas and reinforced his right flank with more units. 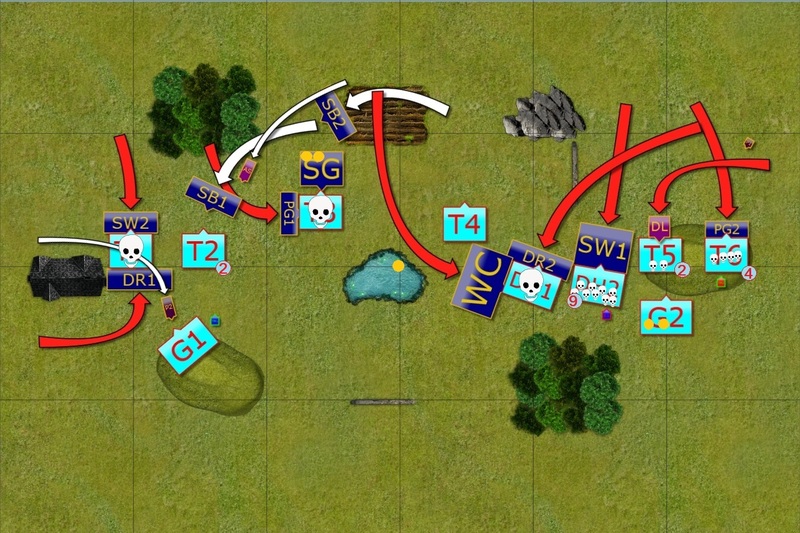 At the same time his left flank was quite strong too and could stop my advance to his half of the battle field. I started deploying with the shooters in the center to be able to direct fire where needed with more flexibility. At the same time it also allowed me to bring some threat to any unit wishing to grab the token in the middle. 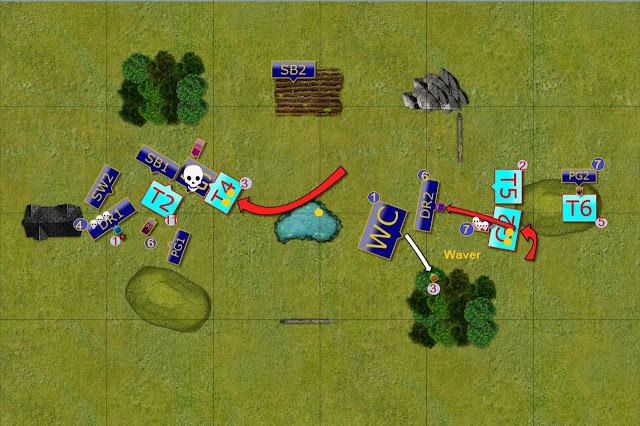 I spread my forces in order to use the maneuverability but positioned stronger elements on the right. I knew they alone would not be to stop the enemy so I wanted to use one round of shooting to damage a unit through which I could break through. 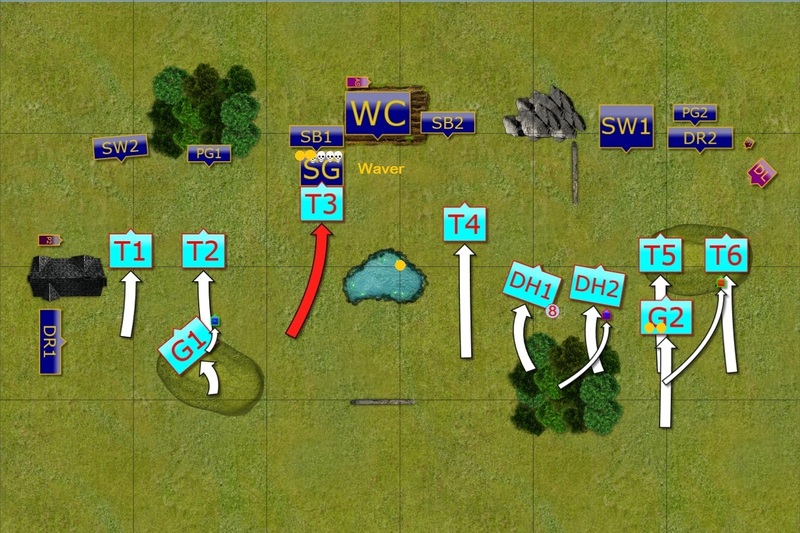 As there were too many elements in Jeff's army and because he had a great redundancy, I decided the best approach would be to shoot at the units on his right first, maneuver around both flanks to create situation where difficult decisions have to be made and keep looking for good opportunities for combined charges. If I could engineer them well I should take one unit on the charge and still be ready to take the counter attack in a way that would not prevent me from counter attacking immediately after. 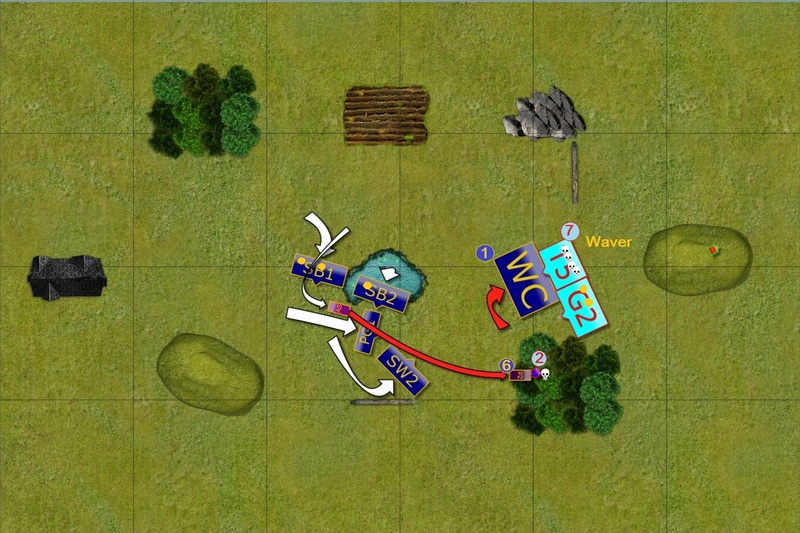 While the above focuses on routing enemy units, I decided it is crucial to do so in order to open a safe passage for the Sea Guard to move through the middle and Push to the enemy territory. Let's see if that worked :) Jeff got the first turn this game. Trident Realms push forward at a double. The army of Neriticans moved forward at a double, eager to get into the fight as quickly as possible. Some of the units advanced through the terrain for extra protection and it was up to the Elven forces to pick their targets now. Elves advanced forward but not as fast as their enemies. Drakon Riders on the left had a good landing spot but the fliers on the right had to wait for the better opportunities. All the shooters aimed at the Deapth Horrors and despite cover, they still inflicted some damage on lightly armored enemies. The Trident Realms units continued their advance. One charge was already executed as Sea Guard moved a little bit too forward. The regiment of Thuul, further supported by magic, stormed in. However, the thick phalanx of shields and spears prevented many blows to land. Sea Guard held their ground, although they were wavered by the ferocity of the charge. Outcasts launch all out attack! 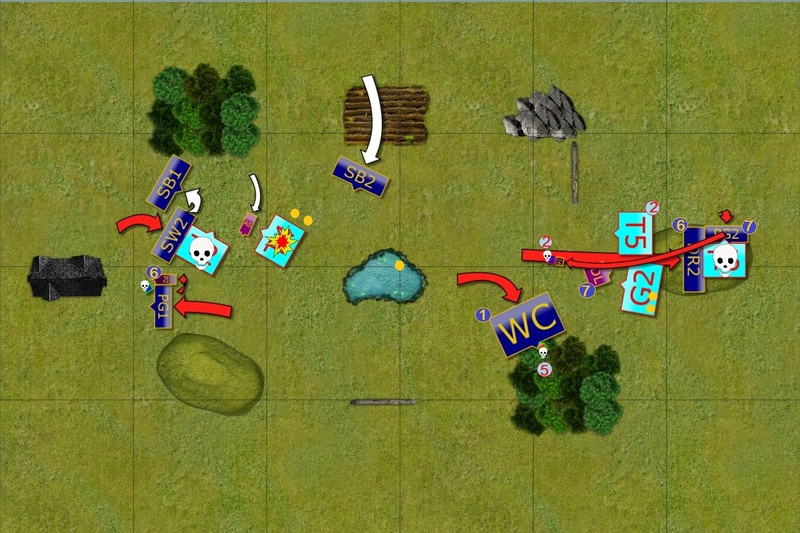 Elves launched all out attack in order to disrupt enemy plans and to seize the initiative. On the left two opportunities presented themselves. First, Drakon Riders and Storm Wind cavalry attacked one regiment of Thuuls and destroyed it. The Prince galloped in between the units to stop Gigas from charging the drakons in revenge. Valiant Sea Guard received much needed help from the Palace Guard. Their timely flank charge routed Tuuls and kept Sea Guard safe, for now at least. War Chariots spotted an opportunity to attack damaged Depth Horrors from the flank and were joined by Drakon Riders. Drakons attacked to help against the enemy unit but also to be in a better position to continue fighting against advancing enemy. Storm Wind cavalry charged second unit of Depth Horrors but their charge was not enough to rout the unit yet. In the meantime, Drakon Lord and Palace Guard attacked remaining two Thuul regiments to distract them and limit their maneuverability. Despite powerful blow, the Nereticans hit back hard enough. On the left, Gigas could not rout the stubborn prince but Thuul Mythican managed to ground the Drakons anyway. On the opposite flank the Elven attack left a few units in bad spots and both, Depth Horrors and Thuul could attack these exposed units. Fortunately for Elves that mistake cost them "only" heavy cavalry with two other units wavered. Another opportunity presented itself and Palace Guard on the left attacked exposed flank of the Gigas. Not able to use their Big Shields in such circumstances, the Gigas suffered a lot of damage and were routed. At the same time, the Prince, Silver Breeze Cavalry and Sea Guard all attacked advancing Thuul but ... only wavered it! What is more, that left Sea Guard in a very bad spot as they exposed their flank to another enemy unit! The fight on the right continued as well. Drakon Lord finished off the Depth Horrors and saved the Drakons. Nearby Chariots also did great by wavering the Mythican. And the flying Prince also performed a very heroic act by wavering enemy Thuuls all by himself! It was important because badly damaged Palace Guard would have an opportunity to fight a little longer. Immediately exploiting the mistake by Sea Guard, Thuul attack the exposed flank and not only defeat the Elven regiment but claim all the loot it was protecting! To add insult to injury, Thuul Mythical routed Drakon Riders too! On the right only Gigas could attack the enemy and Drakon Lord was struck hard. He held but was wavered. The Envoy attempted to attack Drakon Riders but missed and the Elven flying cavalry was free to go again. The battle entered quite crucial stage, with both sides badly bloodied but neither giving up at all. Elves executed two more flank attacks and two more regiments of Thuul, both on the left and right side of the battle field, perished. 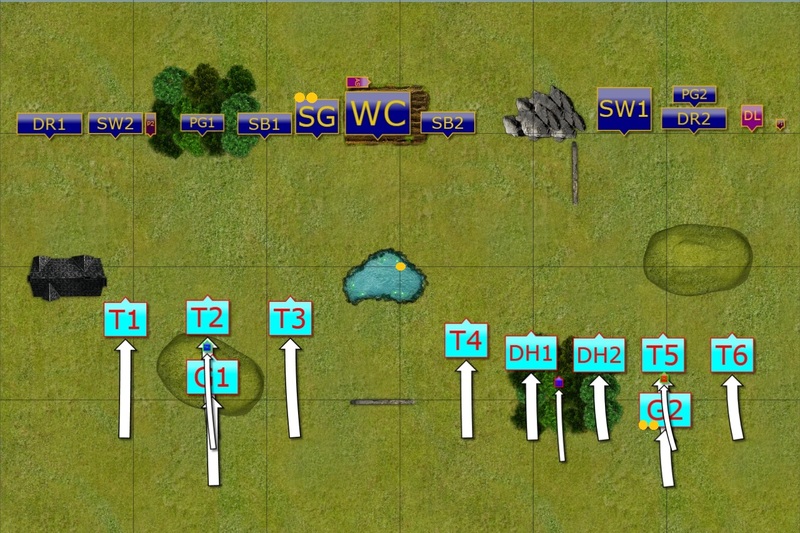 What is more, Silver Breeze cavalry managed to rout third regiment of Thuul by well placed shots. The loot was free to grab again. Trident Realms army lost on the left flank so all the effort was now focused on the right. Thuul and Gigas attacked badly wounded Drakon Lord and captured him. Thuul Mythican, although grounded, was still fast and managed to reach damaged Drakon Riders and rout them too! Elves take back control over the Loot. The units from the left moved at the double towards the right flank. Silver Breeze cavalry grabbed the loot on the way too. In the meantime, Palace Guard and flying Prince tried to rout the remaining two enemy heroes but both failed! With the battle coming to an end it was the time for the last charges by the Nereticans. Thuul Mythican used the opportunity to finally rout the Palace Guard and flying prince was also chased away by the enemy units. Thuul regiment and Gigas tried to use the momentum to reach the Chariots but both failed. War Chariots cover the advance of the fast cavalry. Silver Breeze units, loaded with the loot, turned away from the foe and moved towards enemy territory. 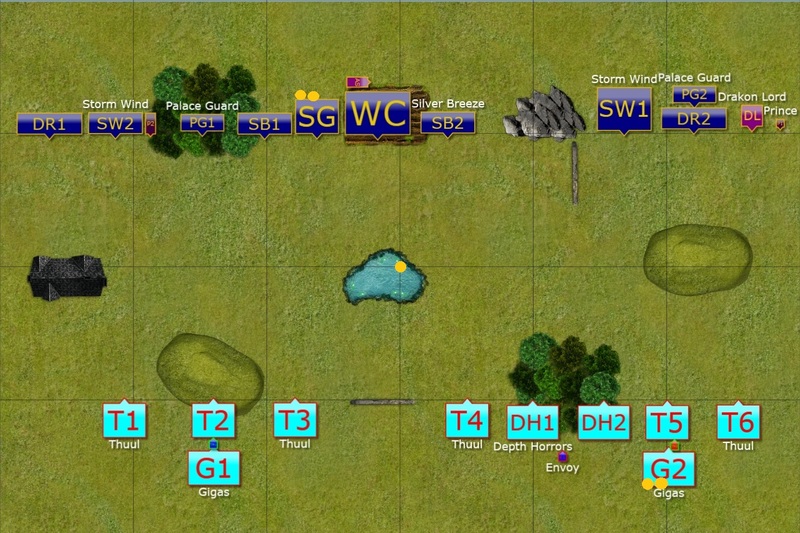 Palace Guard and Storm Wind moved forward to be ready to attack if the enemy advanced further. The Prince and the Chariots attacked Nereticans to slow them down even more. Chariots succeeded as they managed to waver their enemies. Seeing that there is no chance to recover the loot from the Elves, the remaining units and heroes of the Trident Realms army withdrew. Elves, exhausted and bloodied, did not pursue, content with achieving the victory. Many thanks to Jeff for a great game! It was an absolute pleasure to play against him and I am glad I could help with Universal Battle too. I hope Jeff will be now a regular at Universal Battle as well and perhaps more and more Australian players would follow his example. It was fantastic to be a sparring partner and play against a very unique army Jeff brought to the table. We had a quick chat about it after the game and I know Jeff is going to make some tweaks. It is good to know that this game helped in identifying areas for improvement. I am sure Jeff will not only make the army more dangerous but he will lead it to many victories in the future events. I really think this force will catch a few players off guard, especially when commanded by the Master himself! I am also very happy to learn from Jeff. The result, as it is often the case, doe not reflect the fact that many things could have gone different way. I made some crucial mistakes and while this time I somehow prevailed, the next time it may a different story for sure. But the lessons are learned and this is very important for me indeed. I was quite happy with the deployment myself as I had good line of sight for shooting and was able to maneuver at the same time. I would probably move Drakons and Drakon Lord to the flank more to be able to execute similar and quite typical maneuver for the fliers as I did on the opposite flank. Even a threat of such move should be good as that always makes the opponent more careful in advance. My first mistake was to advance Sea Gaurd a bit too far froward. Even in the frontal assault, Thuul can be dangerous and I was lucky Jeff had poor rolls for to hit. While Sea Guard held and that created an opportunity for Palace Guard to flank charge, I should have not allowed such a risky advance. If I lost, I would have not units in position to claim the loot back. 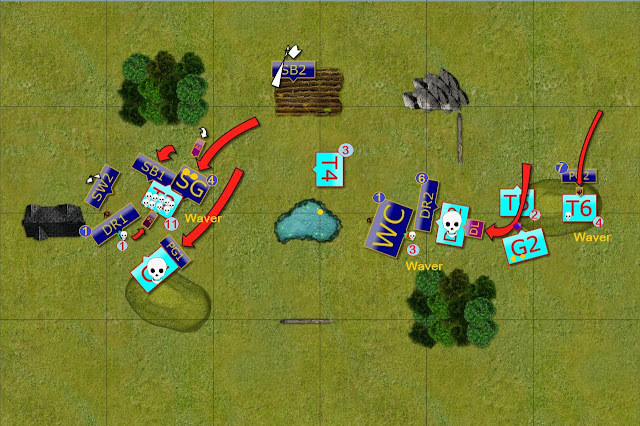 Second mistake was on the right with that massive turn 2 attack. It was one of the options and in general, I think it was not a bad idea. Especially that I had a chance to flank attack with War Chariots. What I didn't notice was that after reforming, Drakons where in the arc of sight of the second Depth Horrors. And I wasted Storm Wind too, because I didn't have good odds to rout the unit in the frontal attack. What I could have done differently here was to attack with Storm Wind and Chariots instead. Although hindered, Storm Wind would have sill contributed to the attack and I would have most likely routed damaged Depth Horrors. However, heavy cavalry has narrower frontage than Drakons and would have not be in the front arc of the enemy unit after reforming. I noticed that I was not able to move back with my Palace Guard in order to avoid being charged by Thuul. But I would still have been able to move back Drakons behind the Palace Guard and Drakon Lord to the flank of the regiment. By doing so I would have kept the pressure on as both flying elements would have threatened many enemy units. 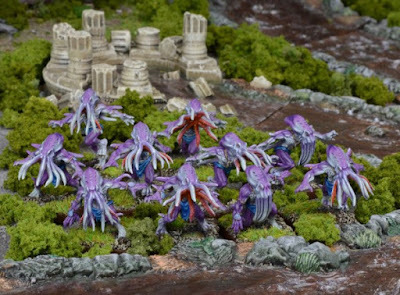 Depth Horrors and Thuul regiment would have not had a chance to attack anyone either and that would have much better situation for me there. On the left there was a smaller mistake where I didn't reform my Storm Wind cavalry properly. I then wasted one more turn to get them into position where they should have been ready for action already. And then I made another super silly mistake by not moving my Army Standard in front of the Thuul unit in the middle (T4) to prevent that horrible flank charge against Sea Guard. Somehow I didn't even measure the distance in case they bounce back. It almost cost me the game and only lucky shooting phase soon after prevented a disaster. I need to avoid such bad maneuvering next time for sure and I am glad I managed to pull out the victory regardless. Once again, many thanks to Jeff for a great game and until next time! Great game! What a neat opportunity to play a reigning master! We recently had one of our local guys start Trident Realms and they are a very difficult matchup for me. Herd lack the effective shooting to take advantage of the low defense of TR which means I have to deal with ensnare if I can’t find a flank! Thuul have become great, and even better in formation which gives them a speed bump, I believe. TR seems like a very fun list with a lot of options and the models are fantastic for the most part. They can definitely catch people out if you haven’t played against them. Congrats on the win, and thanks for the report! I am glad you enjoyed the game as it was a great battle with a lot of action and balance swinging back and forth. Thuul got Speed increase even without the formation as per new Errata. If the formation is added then 1 regiment and 2 troops, together with Mythican would go to Speed 7 it seems. 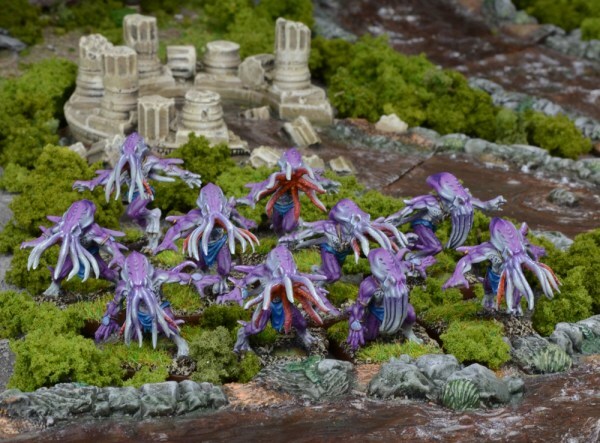 I must say this particular army is not easy to shoot off the table either as Thuul have Stealth already. If they combine it with cover it may be a challenge to get any damage in. In addition, with 6 units of them if one or two die to shooting there are still many regiment to do the job.